United States Department of Agriculture (USDA) hardiness Zone 10 encompasses the southwest coast of California and the southern tip of Florida, where gardeners very rarely have to worry about frost, but rather have to search for plants that can hold their own in the hot sun. Some familiar herbs do very well in the hot climate of Zone 10 when planted as a herb garden, in hanging baskets, or in containers on the patio. The flowers of the herb plants will attract birds and butterflies. Fresh herbs for the kitchen are just a snip of the scissors away. 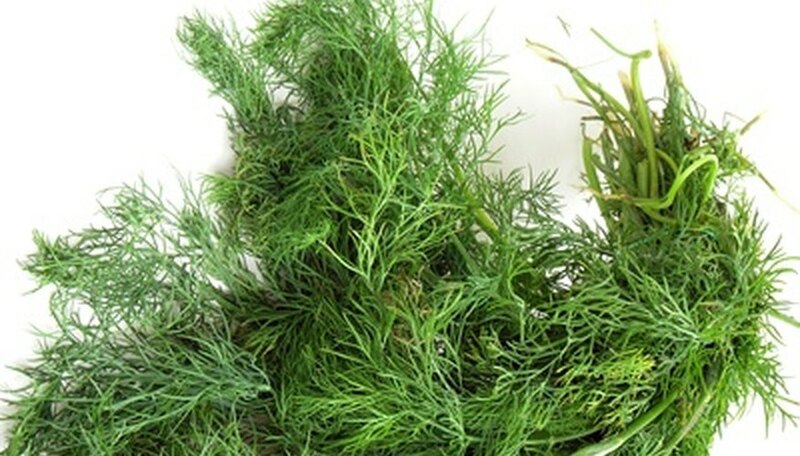 Dill (Anethum graveolens) is an annual herb that grows from 1 to 3 feet tall and produces fine lacy, blue-green leaves that grow about 1 foot long. The yellow flowers grow in clusters up to 10 inches across and produce a flattened fruit pod that measures only 1/8 of an inch long. Plant dill in full sun and a well-drained soil. Dill is used in the making of pickles, in potato, egg and chicken salads, and as a flavoring for vinegar and sauces. Dill should be grown in the winter in Zone 10. Basil (Ocimum basilicum) is an annual herb that grows from 2 to 3 feet tall. It produces leaves that grow from 2 to 4 inches long and purple or white flowers that grow in clusters on spikes. Plant basil in partial shade and a well-drained soil. Basil is used to make pesto and to flavor salads, tomato sauces and olive oil. The herb is also used when cooking zucchini, summer squash, carrots, beans, rice, pasta, tomatoes and eggs. Sweet marjoram (Origanum majoran) is a perennial shrub that grows from 1 to 2 feet tall and produces fuzzy leaves that grow as long an inch. It produces small yellow flowers. Plant sweet marjoram in partial shade and a moist, well-drained soil. The herb is used on pizza, in spaghetti sauce, eggplant parmesan, lasagna and poultry stuffing. Lyreleaf sage (Salvia lyrata) is a perennial that grows from 1 to 2 feet tall and produces green or green with a dark wine-purple blotch, elongated leaves that grow from 3 to 8 inches long in a rosette pattern along the ground. A stem grows from the center of the rosette to hold the tube-shaped lavender or blue flowers that produce egg-shaped seeds that turn dark brown when ripe. Plant lyreleaf sage in full sun and a moist soil. The herb has a mint flavor, and the leaves are used in salads and the leaves and seeds can be brewed for a tea.